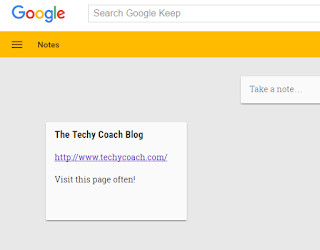 The Techy Coach Blog: Google Keep Users - A Chrome Extension Just for YOU! 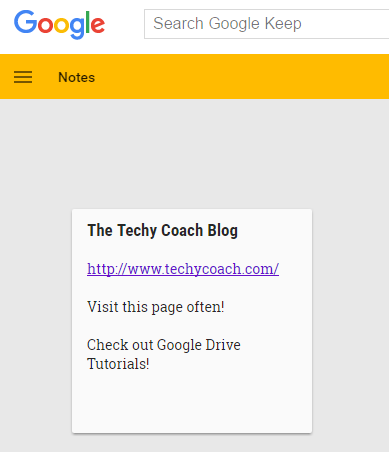 Google Keep Users - A Chrome Extension Just for YOU! 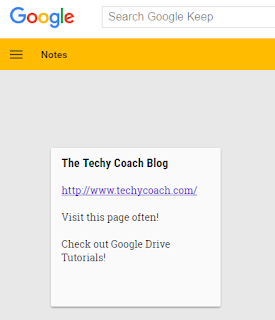 If you are a Google Keep user, it seems that Google is doing all it can to make this tool more robust and meaningful. And I have to say, I like this latest development. 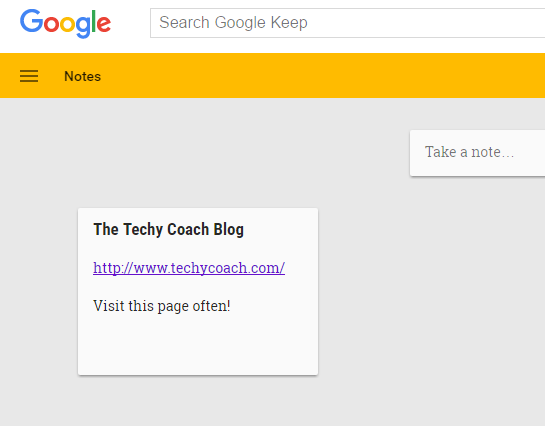 Last week, Google updated the Google Keep Chrome Extension so that you can more easily add URLs, images, etc... as notes to your Google Keep page. Once installed, simply click the icon in your Extensions bar, and leave a note regarding that page. You can also add a Tag to the item to organize it along with your over saves. Your new saved item is automatically added as a note in Keep. Visit the page again, and the Keep Extension recognizes you've been there before, as it shows the Keep icon in Yellow. Any new notes you add for the same site, become part of the same note!